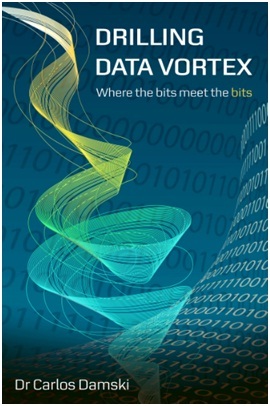 DRILLING DATA VORTEX – AVAILABLE NOW! Where the bits meet the bits. In drilling alone, there are many facets to be interpreted in the digital model. In this book I address the issues related to drilling processes undertaken with the support of data management. Moreover, my bold aim is to level the understanding between people who work in the real world and those working in the digital world, so they can easily understand each other. My second aim is to help improve drilling processes in the real world by using different techniques calculated in the digital world. Those simulations help to devise what-if scenarios, understand risks and assess performance. The correct “data management” of everything involved in drilling will help seniors to record what they learn and enable novices to learn from the past and gain insights for the future. I tried to avoid excessive technicality and academic discussions, instead choosing to explain all concepts in a very simple way. So, hopefully, the book will be easily understood. This book is intended to be read by IT people, engineers, managers, business users, data analysts and everyone involved in the drilling business who are looking for ways to improve drilling processes by using data as one of their pillars. Also available for purchase in Spanish and Portuguese.